The latest news over here at the Duckmandu blog! Yes, Duckmandu is back from a great tour in Japan and is hitting the ground running. Radio Show Thurs, shows Fri. and Sat, and Cabaret Night at the Fishtank on Sunday. Click here for details! One of the most feared instruments in the world will be demonstrated by four of its most notorious practitioners for the Monsters of Accordion Tour 2007! Accordionists Corn Mo of New York, Geoff Berner of Vancouver, Canada, and Duckmandu of Oakland will be joining Seattle native Jason Webley and a special guest in each town for a five city tour of the West Coast from August 21 to August 25, 2007. "I meet a lot of amazing accordion players in my travels, and I thought it would be really fun to bring some of the best of them together," explains Webley, who organized the event. The result is a tour-de-force featuring some of the most entertaining solo accordion performers currently working in North America. But don't expect a night of polkas, because these aren't your grandmother's accordion monsters. Instead Webley and company will be delivering an evening of squeezebox-fueled drinking songs, klezmer-punk dirges, and rock anthems. "I don't even know how to play a polka," Webley explains. The Seattle concert will be the first stop on a five-night "Monsters of Accordion" tour. Webley, Berner, Corn Mo and Duckmandu will also be playing in Portland, Eugene, San Francisco and Oakland. Each night of the tour will feature a local guest player. Bearing a striking resemblance to Meat Loaf, New York's Corn Mo (known off-stage as Jon Cunningham) plays a mixture of glam-rock, circus music and children's playground rhymes. He has toured with national acts such as They Might Be Giants, Ben Folds and the Polyphonic Spree. He has also worked extensively with former Seattleites, the Trachtenberg Family Slideshow Players. In addition to his squeezebox talents, Corn Mo plays piano, writes stories and introduces his songs with spiraling string-of-consciousness rants that leave audiences falling off their chairs. Seattle's own Jason Webley is one of the best known singer-songwriters currently carrying a squeezebox around the world. His relentless touring schedule has built him a cult following all over North America, Europe and Australia, as well as a bizarrely large and loyal following in Russia. Known for his gravelly voice and his energetic foot-stomping, Webley's specialty is involving his audience in his music. Almost all of his concerts end with the entire crowd locked arm-in-arm, singing his tradmark "Drinking Song" at the tops of their lungs. In October, Webley will release his fifth album on his own label, Eleven Records. Geoff Berner is a singer-songwriter from Vancouver, BC. In his music he explores his Jewish roots by playing songs based on his own interpretation of traditional Klezmer music. "I want to make original klezmer music that's drunk, dirty, political and passionate" Berner explains. He has performed with the likes of Billy Bragg and the Be Good Tanyas and his song "Light Enough to Travel" has become a minor standard in the Canadian folk circuit. His new album "The Wedding Dance of the Widow Bride" presents a collection of Klezmer songs steeped in punk and alcohol, following in the tradition of his much-lauded 2004 release "Whiskey Rabbi." Duckmandu is the stage name of Oakland performer, Aaron Seeman. A player with virtuosic technical skill, his repertoire includes, but is not limited to, 70's rock, Broadway, klezmer, classical, country, Sousa marches and even a polka or two. However, Duckmandu's specialty is alarmingly accurate accordion recreations of classic punk songs. His 2005 release, "Fresh Duck for Rotting Accordionists" is a note-for-note re-make of the entire first Dead Kennedys album. Seeman also plays with the Romanian folk group Fishtank Ensemble, composes for San Francisco's "Punk Rock Orchestra" and has recorded with Mr. Bungle. The accordion was invented in Germany in the early 19th century and quickly spread throughout the world. It's portability, flexibility and loud volume made it a tremendously popular folk instrument, becoming the driving sound in a variety of musical styles from French musette to zydeco, Argentine tango to Klezmer. In North America the accordion suffered a big blow in popularity with the rise of the electric guitar. 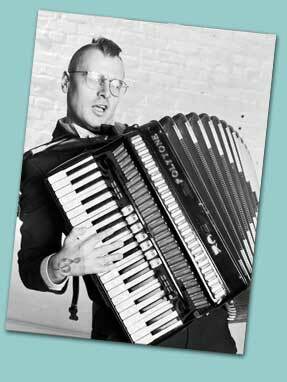 The squeezebox became associated exclusively with polkas and Lawrence Welk, and by the 1980's it had become the musical symbol of nerdiness. However in recent years, the accordion has enjoyed a renaissance in attention. Partly due to the efforts of accordion troubadours such as Webley and his fellow monsters, more and more young people have been picking up the squeezebox again. The accordion has been finding its way into roots music, cabaret groups, punk bands and in recent years, a few high profile rock groups such as the Arcade Fire and the Decemberists have made the accordion a staple part of their sound. "These things move in cycles, you know" says Webley. "I can foresee a day when playing the electric guitar will be a laughable thing, and people will be embarrassed to admit they ever took guitar lessons as kids." For a complete schedule of Monsters of Accordion, click here! You can now buy Duckmandu's album online, via CDBaby! 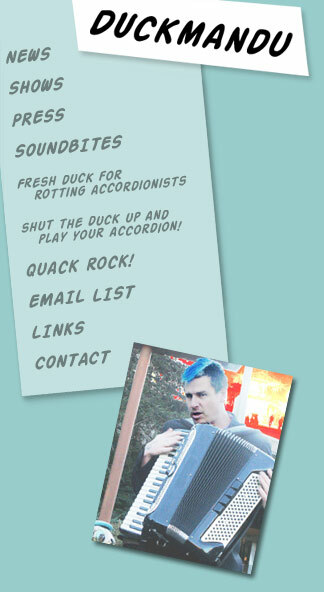 Read about the album Fresh Duck for Rotting Accordionists!